This image is for informational purpose only. It may not reflect the finish or condition of the product you have selected. The image may contain parts of the vehicle or other parts. They are not included with the product purchase. 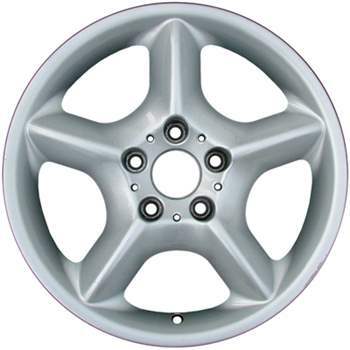 This is a set of 4, 5 Spoke 17x7.5 inch, 5x120 bolt pattern (40mm Offset), One Piece Alloy Factory, OEM Wheel, Rim. The position on the vehicle is: Universal. The Manufacturer Part Number is: 36111096159 and the identification stamp/number is: 36116754466. Our Company is not affiliated with Bavarian Motor Works. All trademarks mentioned herein belong to their respective owners. Wheels and Caps offers one of the best warranties in the automotive marketplace. If your product is not the correct product, or not what you expected, simply contact our Customer Service Department and explain the reason for the return. Please keep your original invoice which is required for any returns or replacements. We will be happy to issue a Return Authorization Number to you to return your product to us. We will issue a replacement to you at that time. Our goal is to make sure you receive the correct products, and that you are fully 100% satisfied with your purchase! Please see “Returns” for complete instructions on how to return a product. All products, companies, trademarks and registered trademarks are properties of their respective owners. Manufacturer names, symbols, and descriptions that are included in any image or text are used exclusively for identification purposes. It is neither inferred nor implied that products listed are authorized by vehicle manufacturer or is in any way connected with any vehicle manufacturer.